With a rugged design and a 50°C ambient temperature rating, the RVS-DN Soft Starter is suitable for working in harsh conditions. It incorporates unique features such as, pump control, energy saving, slow speed and electronic reversing. Magnetek's compact MLTX bellybox transmitter incorporates the latest polymer technology in a lightweight, comfortably contoured, yet durable case. The MLTX Radio Remote Control System can be configured to many options to meet the needs of a variety of applications and industries. 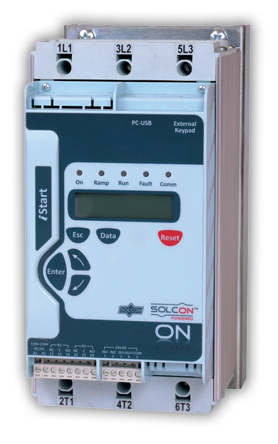 Digital Soft Starter 31-1100A, 200-600V with built-in bypass. The iStart incorporates enhanced soft-start and soft-stop characteristics providing the best solution for most applications. These durable, rugged, and feature-rich radios are ideal for use in material handling, overhead crane, and industrial applications. Flex EX2 transmitters are ergonomic and lightweight, and are available in 4, 6, 8, and 12 button style options to meet all your application needs. Magnetek offers two wireless transmitters ideal for hazardous or potentially explosive locations. For applications where space saving is an advantage, the Contrel ELRC-1 range of Earth Leakage Relays, with it's built-in torroid is idealy suited. Even with it's reduced dimensions the ELRC-1 has just as wide a range of settings as other earth leakage relays.. Accurate Speed control and starting of electric motors. Safe and Reliable Wireless control. Smooth Starting and Stopping of electric motors. Protection and Monitoring of electrical systems.